I have a large area in my backyard that will soon be completely open when my tree cutting work and landscape renovation is complete. I am having a lot of difficulty in trying to figure out out to fill the space because I do not want the 60 foot opening between my yard and the people behind me. If you have any suggestions on plantings for this area please let me know, I need some serious help. 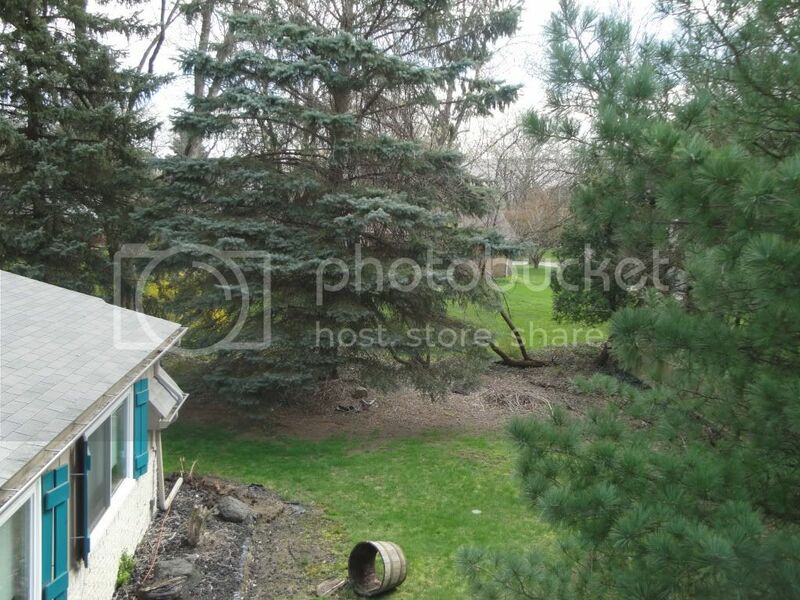 I have attached a couple pictures of the area, the trees are still in the picture. I am getting rid of the russian olive in the right corner and the spruce that is directly to the left of it. P.S. This is in Michigan so I am trying to find something that will give me some sort of coverage in the winter if possible. so you are going to cut down the huge old evergreens and then you want to plant something to give you the privacy that the evergreens now give you? Seems like you could just not cut down what is there. The problem is that the evergreen has a strangler vine that has killed it. I have been told that it will no longer survive. I tried to kill the vine but it has taken over the tree too much. Because I have to get the yard ripped up for a drain system to be nstalled because of flooding I was told to do all the work at once. You are right otherwise, I would have just kept it. The Russian olive is also dead at this point from kids playing on it and so forth. My first choices for a dense screen would be Western Arborvitae Thuja plicata 'Green Giant', as they are very fast and have little issue with disease and insects. Spruce like you had or Norway spruce are both good choices as well. In a 60ft. section I would plant more than on type of tree ao that is you do ever have a problem with disease or insects you won't loose every plant at one time. Eastern red cedar is a very fast growing screen as well, and there are many different cultivars. As I say though, the Green Giant would be my first choice. PS If you have access to a good nursery Crytomeria japonica 'Yoshino' - Yoshino Japanese Cedar is an awesome tree too. Very fast as well. Awesome, thanks for the ideas. Do you think that even though there are another three evergreens to the left of the one im taking out that planting different things would look okay? the landscape contractor keeps telling me that it will look choppy (especially with arbrovitae). If trimmed will the trees you have suggested remain a certain height and width so that they do not take up so much lawn again? You insurance should cover some of that work so I would question them since there are some large tree diggers in the area that could replace what you need to take down. Pressure them. Besides Arborvitae are ugly and prone to snow damage and a severe winter will put you back to square one. Even though they are native to my region and are prominent part of the plant community of this particular area, I regard eastern red cedar with some negativity since they carry the cedar-apple rust and causes problems for all of my apple-family trees. Unless there are already many cedars around you, you might want to keep this in mind if you think you'll want to plant apples, hawthorns, amalanchiers, etc. The soil is full of quite a bit of clay and the water table is quite high in this area. 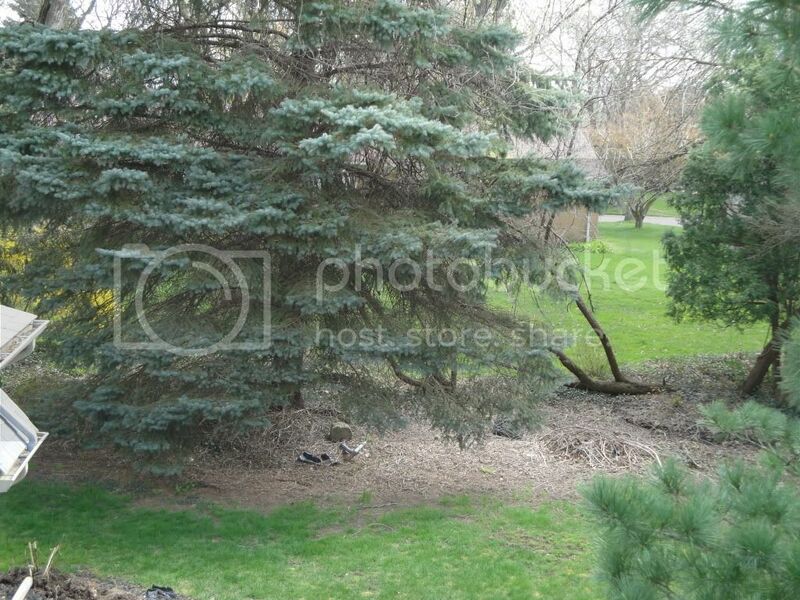 This is in the backyard and to the left of the picture there are only evergreens and one japanese maple. Would the insurance cover it because it is overgrown? I guess im really just trying to figure out a good, easy to maintain, screening option so that when im off to med school my parents will have easy maintenance without me there. I have posted this several times- I will make it as clear as I can this time. These are ALL types of Arborvitae. By simply stating that "Arborvitae are ugly" does no justice to the hundreds of different cultivars that are available. Thuja plicata x is the TREE, not tall shrub, that I am refering to and it is anything but ugly. It is most often considered a very stately tree that has MANY attributes over any other screening evergreen. 1. It is very fast growing. Something that can not be overlooked when shopping for a plant to for a quick visual screen because the vast majority of evergreen ARE NOT fast growers. 2. It is not disease OR insect prone. 3. It is most often grown with a single leader, and has descending branches that shed snow making it resiliant to ice and snow. 4. It is versitile in that it can grow well in dry or wet sites- again a very uncommon attribute for evergreens in general. 5. It requires no pruning or shearing to maintain a dense wall of foliage in full-sun or even part-shade. As for your local landscapers telling you to rid yourself of existing trees and replant- I look at that two ways. It puts more money in their pocket, or an entirely fresh start could enhance the look of your yard if the right designer was involved and you don't mind the added expenditure. I hope this helps to clear up some of the differences between the typical "ugly" 'Emerald Green' Arb and the Western Arb derivatives. Seeding and area of lawn over an area of concrete?